A 76th Birthday Gift For You! It’s that time of year again when we celebrate the life and legacy of our dad, Jerry Garcia! 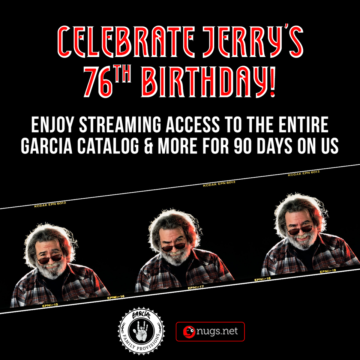 To honor Jerry’s birthday this year we are giving away 90 day Nugs.net memberships so that you can listen to Jerry’s catalogue and explore all the other great artists that our friends at Nugs.net stream! To unlock your membership, join the email list at JerryGarcia.com and you’ll receive a unique code via email within 24hrs of signing up. Let’s remember the good times and keep the love alive!